Sunday night: Clear. Coastal Fog. Lows near 70. Monday: Hot inland, cooler at the coast. Mostly sunny. Highs in the mid 80s. Tuesday: Hot and Humid. Highs in the low 90s. More dangerous heat is on the way in the coming days. High temperatures Sunday reached the low to mid 90s in many locations with dew points (humidity) in the mid 70s. Heat indices reached dangerous levels of 105 degrees or higher. Places like Orange, Massachusetts and Keene, New Hampshire reached 100 degrees. This was the warmest weather inland locations experienced in several years. Even in Boston, temperatures reached the low 90s before the sea breeze moved in. With a high temperature of 92 degrees, it was an official heatwave in the city: Friday 90 degrees; Saturday 92 degrees; and Sunday 92 degrees. Temperatures Monday won’t be as hot along the coast. Highs will only reach the mid 80s with an onshore breeze. 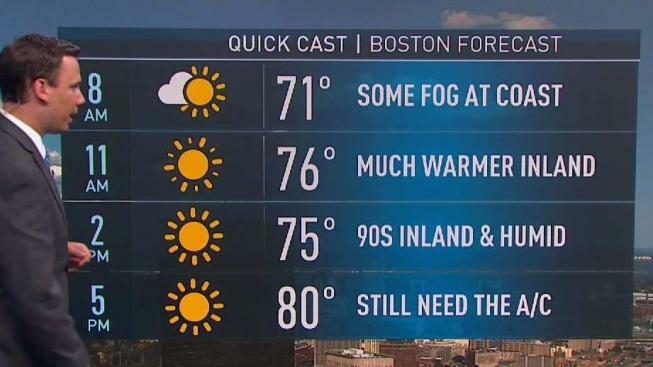 There’s a chance Boston could experience its second heatwave Tuesday through Thursday. For inland locations, this heatwave will continue through at least Thursday. Most days will be dry, but with the high humidity, showers and thunderstorms will be possible starting on Tuesday. The threat for thunderstorms will increase through the week and there could even be some strong storms by Friday. As far as when the heat will break – by next weekend. Once the cold front moves through, temperatures and dew points will drop. High temperatures will climb into the low 80s on both Saturday and Sunday. Currently, it looks like a nice weekend. Heat and humidity may return as early as that next Monday. Shower and storm chances will also go up.